In purchasing equipment for the outdoors, I always use the same thought process. How often am I going to upgrade my equipment based on the new radical improvements that the manufacturer will come out with? How long before my existing equipment will become obsolete and I will have to replace it? How long will it be before I have a disadvantage with my existing equipment? When the time came to choose a tent, I decided that I would choose the best tent that I could afford based on the use of the tent. The quality of your experience outdoors is greatly dependent on your choice of the right tent. That is why there is such a large selection to choose from... and I, might add, a tough decision. There are 4 basic components to a tent: the poles, the body of the tent, the rain fly and a tarp (ground cloth or footprint to extend the life of a tent's floor - optional). Decide on what you will mostly use the tent for and what features you would need based on the type of camping you expect to do. There are many tent features to consider when choosing a tent and all the options available are important. How many seasons will you use the tent? The Summer Tent is lightweight, designed for hot and humid weather only, have a lot of mesh for ventilation, has a rain fly that allows for ventilation and usually has 2 poles. The 3-Season Tent has 3 poles, a rain fly that does not allow ventilation and also protects from the weather, sometimes has a vestibule and sometimes has a skylight window for extra light. The tents are intended for spring, summer and fall. They perform well in wind and rain, though their designs are not suited to handle significant snow loads. If you're a recreational traveler and do the bulk of your camping between May and September, choose a 3-season tent. 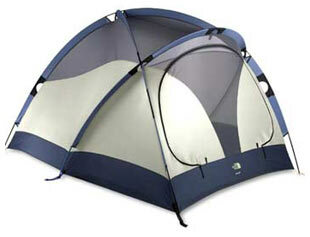 4-Season Tent has 4 poles, skylight for extra lighting, a removable vestibule and usually mesh with zipper windows. They are built for prolonged exposure to severe winter conditions: high winds, heavy snow falls, cold temperatures, intense UV exposure, etc. Pick a tent equipped to withstand the harshest conditions you might encounter. What type of activity will you be doing? If you are car camping, the weight and size will not be a factor in deciding which tent you will choose. If you are kayaking, the weight and size might not be as much of a factor since the components of the tent can be packed into 2 kayaks (when you are paddling with a friend). Obviously, if you are backpacking, the weight of the tent is a major factor. How much room do you need for your tent? How many people will be sleeping in the tent? Are you tall, large, etc. Never purchase a tent without being able to get inside, move around, put your mattress in and generally see how that particular tent functions for you. If the tent is not available, use your sleeping pad as a gauge to how much floor space you will need and lay it out on a piece of paper based on the floor size of the tent. Do you need any extra room (maybe choose a 3 person tent for only 2 people)? If you are hiking, share the tent components as you hike. Someone can carry the poles, rainfly and another person can carry the tent. How do you rate your preferences? Rate all your preferences in the order of importance such as: price, size, weight, number of windows, ventilation, number and placement of doors, tent shape, vestibule, sturdiness, ease of set up, color, storage areas, waterproof (floor coating that extends about four to six inches up the sides which prevents the seepage of ground moisture), etc. Check to see if the tent you are considering is completely seamtaped to prevent leaks in the rain. Will condensation appear inside the tent? Condensation is something to be concerned about when choosing a tent. Ventilation alone will not prevent condensation. On double wall tents, look for panels of coated fabric, high coated side walls, or coated fabric doors, which always bead up with condensation. Full coverage rainflys often have heavy condensation, because there is no way to ventilate in poor weather. Look for awnings over the doors that can stay unzipped a little in the rain. How easy is the tent to set up? If the tent is available to set up, try to set it up! Where are you going to store your gear? Usually the definition of the size of the tent (3-person, 2-person) is the number of people that can comfortably sleep in the tent WITHOUT gear. Ask what the definition of the 2-person, 3-person tent is on the tent you are going to choose. What is the tent material and what are the poles? Poles are the main factor in determining a tent’s stability. Choose fiberglass poles for durability, and aluminum poles for lightweight strength. Polyester fabrics withstand exposure to ultraviolet rays better than nylon tents and are the best choice for long term campsites. Nylon tents are generally lighter in weight. Don't forget to learn how to maintain your tent correctly because incorrect methods might damage your tent and choose a camping tent wisely.